Turning Vision Into Action: The Aspirin Principle - Knowing What Is And Is Not a Choice! The Aspirin Principle - Knowing What Is And Is Not a Choice! Last week, I once again, encountered the often heard Professional Learning community (PLC) concern, from a task force of local teachers and administrators regarding highly effective collaborative practices for grade level or course based teacher teams. Aren't you just trying to make us all the same? Where is our individual freedom and choice to do what we think is best? 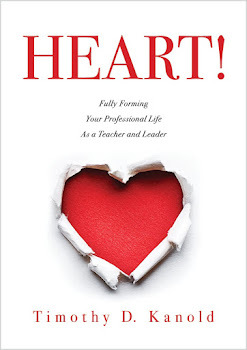 The question is a legitimate question, especially for those faculty or administrators who don't quite understand the "Loose-Tight" nature of the PLC culture in such a way that they can clearly articulate to one another what is and is not a choice for the teaching and learning of all students in a grade level or course. I call this the Aspirin Principle. The researchers found that patients who took low-dose aspirin had a 26 percent reduction in the risk of a nonfatal heart attack, a 25 percent reduction in the risk of stroke and a 13 percent reduction in risk of death, compared with similar heart patients who did not take aspirin. Taken together, Berger said, patients on low-dose aspirin had a 21 percent reduction in risk of experiencing a major cardiovascular event, a measurement that is the combination of the rates of nonfatal heart attack and stroke and of cardiovascular death. Seems that taking an aspirin a day should not be a choice for these patients. The results, published in the Lancet, showed that aspirin reduced death due to any cancer by around 20% during the trials. But the benefits of aspirin only became apparent after taking the drug for 5 years or more, suggesting aspirin works by slowing or preventing the early stages of the disease so that the effect is only seen much later. You can read more about these studies, but it makes you wonder, shouldn't we all take the same action? Is taking the aspirin and increasing our chances of success a choice? Really? This type of "tight" choice making decision confronts learning teams in a PLC all of the time. Consider the known research and value benefits of creating daily lesson designs that honor effective student-engaged learning. Marzano's meta-analysis of the research (2007 and 2011) shows large effect sizes with anywhere from 14%-18% gains in student achievement in mathematics, reading and writing if the "Choice" is made to do so. Do faculty members or administrators have the right to fly outside the student-engaged learning as a choice boundary and not actively engage students? In fact, you and your colleagues have an ethical, professional, and moral obligation to ensure every student takes the aspirin of student engaged learning and reduce their risk of failure. What is "loose" however, is the use of many different structures or methods to implement actions that serve the "tight" choice of student engaged learning. How to design lessons that achieve this tight value can and should be loose. As a PLC leader you must give the faculty and staff autonomy within defined and well-articulated boundaries. Paul Sullivan, in his 2010 book Clutch, indicates that one way to eliminate the stress in making clutch decisions is to provide parameters that focus the decision-making process. Essentially, the parameters (or tight boundaries on choices) provide the focus needed to meet the targets for student achievement in a PLC. This is the wonderful paradox of the loose-tight or “defined autonomy” PLC leadership culture. Looking back, I had given teacher use of "Desks in Rows" as a teaching and learning structure seven years to work. Seven years! Given the choice as to whether or not our faculty and staff should implement the vision of student-engaged learning, over seven years, several made the choice not to implement this research affirmed practice. My lengthy toleration of choice not to implement student-engaged learning revealed something about me as a PLC leader. Initially, I was not very well trained on the idea of a loose-tight model. To be that tight about something (“We will no longer teach using rows”) requires the leader and his or her colleagues to provide greater clarity that it is a “right thing” to do as a tight choice. I had to demonstrate I understood the details and questions that could cause confusion as together we attempted to implement effective student engaged learning practices. Achieving clarity also meant that as long as the spirit of the vision and value (student-engaged learning) behind the use of "Students sitting in teams of four" was being honored, then teacher learning teams should have significant freedom of choice and ownership about how to get it done well (loose, facilitative leadership with autonomy on the implementation side). The choice for how to implement student-engaged learning could and should be loose. However, whether to embrace student-engaged learning and implement this vision value was not a stakeholder choice anymore—not a choice of the students, parents, teachers, leaders, or fellow administrators. No need for debate. At some point you must lead the organization into full implementation of a research affirmed vision. Otherwise, why are you leading? 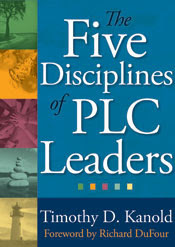 When the PLC leader exhibits tolerance of the vision and values of best practices as a choice, then chaos reigns, accountability becomes random happenstance, wide variance and inequity become an enemy of the school or program, celebration becomes less focused and empty, and the “direction” of the work becomes lost. Like good parents, professional learning community leaders set boundaries on adult behaviors and actions, then support and defend movement within those boundaries. They understand the benefits of "Taking the Aspirin" as a vital behavior within the organization and allows for choice on how to get it done. What needs to be your Aspirin moment in 2011-2012? Start looking ahead. What must you and your colleagues become "tight" about in 2011-2012? Every child in a specific grade level or course has the right to experience teaching and learning with educators that understand what is and isn't a choice. As a language educator, it is important for me to realize that language is about making meaning and that meaning is created by people and not just by a rote set of verb conjugation charts! Fundamental to this notion is the idea of cooperative learning and how true cooperative learning is NOT just about grouping. The pillars of cooperative learning were identified by Johnson and Johnson (1999) and include the following components: positive interdependence, simultaneous interaction, individual and group accountability, positive interdependence, and equal participation. I mention all of this because cooperative learning has an effect size of .78 compared to other instructional strategies in which students work on tasks individually (Marzano, Pickering, Pollock, 2001)! Even with all this logic supported by research, it has not been easy to promote the use of cooperative learning in our classes. While some teachers have embraced the idea, others have yet to fully understand why this is not just about students sitting in pods of four. It is here that I must practice my "loose-tight" leadership especially if the research is so relevant to our philosophy in teaching and learning a language. Ultimately, a teacher may choose to incorporate only some elements of cooperative learning while another may choose to buy the entire Kagan catalog! Nevertheless, what I will not compromise is the student engagement and the increased level of student participation that are afforded by cooperative learning structures. I love the Aspirin Principle! I'll be certain to add it to my collection of PLC teaching tools. It makes sense, and it's a great way to explain a non-negotiable...because it's good for us! Student engaged learning, collaboration, assessments for learning, a focus on results, and a consistent and viable curriculum are areas where we must remain steadfastly tight in order to achieve our district's mission and vision. As I have explained in my practice, the areas mentioned above are our district's foundation and framing pillars. The foundation must be laid carefully without compromise, and the pillars must be placed solidly to ensure that we can build our very best school together. The design, the architecture, the colors, the artistic details, and the upgrades are all still to be determined by the experts--the teachers! Loose and tight leadership is essential in building an optimal learning environment for our students and staff. We owe it to our kids to be mindful of the Aspirin Principle! John Dewey said, "If we teach today's students as we taught yesterday's, we rob them of tomorrow." I can't think of a more appropriate statement in today's educational culture (even though he said it 100 years ago). My "Aspirin Principle" revolves around moving teachers into the 21st century in their instruction. Sure, student engagement is a part of that, but the bigger question is how to engage students in their world, not in the teacher's world. How do we reach and engage them in activities that they feel committed to? For me, student engagement must include some form of authentic learning and realistic problem solving. In this post, Dr. Kanold asks "Where is our individual freedom and choice to do what we think is best? He is referring to teacher choice and autonomy in the classroom. I ask a follow-up question: "When do we allow students to make choices and have some autonomy in their own learning?" In other words, for true student engagement, teachers must end the "sage on the stage" mentality and instead, empower the students to take more responsibility in their learning. Then, they will be engaged. I would be lying to everyone reading this comment if I said I had ever heard of (or remembered) the Loose-Tight Principle and I thought I was up to date regarding my understanding of the PLC model. How did I miss such a simple concept? Regardless, it's application to the Aspirin a day concept makes perfect. However, take a walk with me for a moment and try to make sense of this concept. What if my Aspirin a day concept is not really my concept at all? What if the reality is that I am following a "tight" decision made from above and I am pushing that decision out to everyone else? Is there time for my own Aspirin a day concept? I would love it if in our collaborative leadership model someone wanted to know what I think needed to be that concept for my team. Just as teachers do not have a choice in the new world order of student-based, data-informed decision making, so too should they not have a choice when it comes to student-engaged learning. It is NOT about making them instructional automatons, but rather about ensuring some level of consistency of expectations and learning experiences. So is it, too with the Common Core Standards. That is WHAT we have to teach, but the individuality and artistry comes in the HOW we teach. "The collective power of a school faculty (or team) united behind a few, important, commonly prized outcomes for students is virtually unlimited." (Saphier and D'Auria) This is the power of the PLC model. It is about empowerment, not about stripping away individuality and entrepeneurialship in teaching and learning. I absolutely love the concepts behind the Aspirin Principle. When leading my staff through decisions that often do not afford choice I try to lead with what I have referred to as rigid-flexibility. I am rigid regarding choices that relate to engaging students, implementing curriculum with fidelity, making data based decisions and use of assessments for learning. The flexibility comes into play regarding the strategies or processes used by teachers to engage, teach and assess students, which can at times reflect their personal choice, understanding of students and creativity. Teachers often state that they feel like robots, unable to implement creative lessons without approval from the administration. When making these discussions I will try to implement the loose-tight principle which allows for creativity and choice within a set of non-negotiable parameters. I couldn’t agree more that as the leader of my building it s my responsibility to set boundaries and coach staff on how to work within these boundaries, yet explore creative strategies to engage, assess, and teach students. At the moment my Aspirin moment revolves around the use of data driven decision making. I will be rigid when it comes decisions made based on a gut feeling or instinct. Hard evidence and data must drive all decisions and I will remain tight on this issue. As morbid as it may seem my first thought when reading your chapter on the Loose-Tight model was in relation to the slave ships traveling from Africa to the Americas. There was the tight pack method where the slaves were laid on their side next to each other to save space to transfer more slaves, but it also led to a great percentage of casualties given their close proximity and the spread of disease. With loose pack the slaves laid on their backs and were more spread out which meant one was not able to transfer slaves as quickly across the ocean but more survived. I believe this concept (apologies again for the morbid nature) applies to leadership. If you are too tight you will move the initiative quickly in the direction you want it to go but you will lose many supporters along the way. You lead too loosely and you have less 'causalities' as people remain happy doing what they want but you also lack efficiency and the initiative takes a long time to move forward. By tapping into that loose-tight balance effectively you can efficiently move forward in the right direction with colleagues that are able to have control over how they achieve what they are directed to achieve. I could argue that the single most significant component to the loose-tight model would be that the PLC leader's values are clear and very well-articulated. I feel that some leaders may think their vision for the district (or the Board's vision) is out there and the staff knows what "it" is, but often it is not, leading to confusion and a “'direction' of work [that] becomes lost." Recently, I communicated my expectations about professional behavior at an inservice. I said that cell phones (for texting) should be away and off-task side bar conversations should be kept to a minimum. Later, I was told that some staff were insulted that I stated what were perceived as childish expectations. I truly felt bad that I made some staff upset/insulted. However...I felt the staff was engaged in the professional development better than every before and we received positive feedback from the superintendent. In this example of a non-instructional situation, I probably will never need to outline my expectations again, but it was important once. When leading high quality instruction, I imagine that it is necessary to state and repeat the expectations over and over again. By outlining the rationale for whatever is tight and by exaggerating the idea that teachers have the freedom to choose how they will make the non-negotiable happen, will eventually bring positive student results. The Aspirin Principle is very true! Research suggests simple changes we can do to make a significant impact in our lives like taking an aspirin a day or moving student desks into groups of four, but WHY, WHY do we ignore these changes? I believe two reasons educators do not follow the advice, one, change is hard, and two, change may require more work. When I sit in PLC meetings I often have to defend the idea that I am "making sure that they are all the same concept" but rather I defend the idea of research based practices, equity and access, and consistent delivery of curriculum. Leaders can establish those frameworks or boundaries that offer the non-negotiables but allow the PLC team the autonomy that they crave and deserve. I love "the asprin principle" it makes so much sense! What doesn't make sense, is that we are a group of professionals that has research all around us, and we are not consistently using it. We know that schools are historically reluctant to change, however studies on best practices are not new, and yet we (the educational professionals) are still trying to minimize the validity of the research. As school leaders, the question becomes are we expecting our staff members to read, understand, and apply the findings from the research, or are we taking in the research and shaking our heads when the staff don't keep up on their own? Are we sharing and discussing best practices, or are we hoping teachers take additional course work? Using best practices in the classroom is not a choice, and expectations need to be consistenly high. We are using the evaluation tool as a way of holding individual conversations with teachers and clearly articulating our expectations for strong, research based instruction. We have seen changes in our school as a result, and we still have a lot of work to do. I really like the concept of the “Aspirin Principle” as I feel it is important to establish the non-negotiables as these will be the core values to guide the work of staff members in a school throughout the year. I was on the committee that helped develop the strategic plan for a school district. From the information we gathered, it was evident that all stakeholders (students, staff, parents, and administrators) knew that learning targets were tight as they were embedded in the work of every classroom in the school district. The “loose” factors seemed to be a point of contention as some interviewees noted that they would like to be told exactly what to do and while other people wanted the freedom and autonomy to make those decisions. While I get the concept of 'loose-tight' leadership and the theory behind the 'aspirin principle,' I wonder what the best way to accomplish this work is. In discussing school improvement and system-wide leadership, it has been brought to the attention of our cohort that schools should adopt a few (2-3) initiatives and focus exclusively on their development and implementation. Does this same theory apply when identifying what to be 'loose' and 'tight' about? In looking at the systems in which I have worked, I believe I possess more than just 2 or 3 non-negotiables that I would want to articulate and expect if I were to become the leader. I wonder if these 'tight' expectations are better served up in smaller doses or, if because I find them so vitally important, it is okay to outline and expect changes related to them all at once. This is something I need to ponder and decide upon before being faced with the decision of what, when, and how with respect to my non-negotiables. - We will monitor and support the implementation and regular use of research based strategies for improving student achievement including those discussed in the Strategic Teacher (Daniels) and in the work of Marzano through the use of an enhanced classroom walk-through tool for our five-five-five visits (five classrooms for five minutes five days per week.) The lack of use in these strategies is no longer a choice. - Every teacher in the language arts, science, and math classrooms will utilize the common assessments that have been developed by the District's curriculum team and this data will be used in conversations about what students are learning. Using common assessments can't be a choice. There are, of course, more things that I think that we need to be tight about this coming year, but as the student services coordinator, I can only imagine the impact that being tight about these two things could have on our students and the learning that occurs in our school. I'd imagine that I would have much more realistic data to help parents to understand that their student is learning. I know that many of our students with Attentional issues would suddenly become more engaged. It seems so simple, yet I know that when teachers return in the Fall, there will be some trepidation on my part about an announcement that these are the things I am going to be tight about this year. That's alright in my book because it is a risk worth taking since our students will be learning at much higher levels than our faculty could have ever imagined. I really enjoyed reading this post because it made so much sense to me as a district leader. Why do we, as leaders allow practices to go unchecked that we know are not sound? During our Red, Yellow, Green activity in class, I committed to stopping the practice of turning a blind eye to teachers who were not teaching the curriculum with fidelity. As a district leader, I know that these practices must end. And just like the patients who take their aspirin every day to prevent heart attacks, I will stay true to my commitment to effective instruction that teaches the approved curriculum with fidelity.